The Superior Plantscapes company history dates back to 1969, when our founder, horticulturist Archie Amate decided people in office buildings shouldn’t be isolated from Mother Nature. He devoted his nursery to developing specimens and growing methods acclimated to the interior environment. One of his evergreen plants, the “Amate,” is still sold in many nurseries. Today, Archie’s nursery has grown into a full service plantscape company. 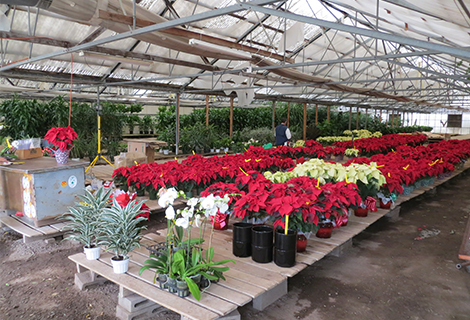 It occupies two acres of land with an over than 30,000 square feet greenhouse, state certified pesticide applicator, interior design studio, display fixture fabrication, and one of the largest purposely equipped service truck fleets. We serve hundreds of clients from neighborhood clinics to Fortune 500s all over Southern California. We’re proud to have a company history 45 years in the making. During this time, we’ve grown to become one of Southern California’s premier interior plantscape companies. Most of our new clients come from referrals, as we have built a reputation as a business our customers can count on.